Tattoos aren't as permanent as they used to be. Good thing, since tattoos can lose their appeal over time. With laser tattoo removal, you can drastically reduce the appearance of your tattoo with excellent long-term results. Laser tattoo removal is the treatment preferred over skin bleaching or surgery, because it doesn't damage your skin--but it does target and destroy tattoo ink with precision and ease. The result? Even the darkest tattoos fade away. When you're ready to say goodbye to your tattoos and hello to clearer, ink-free skin, you're ready for laser tattoo removal to make your tattoo fade away. Laser tattoo removal can be performed on all skin types, and it can be used on faces and bodies. It's the tattoo removal solution for dramatic, lasting results. 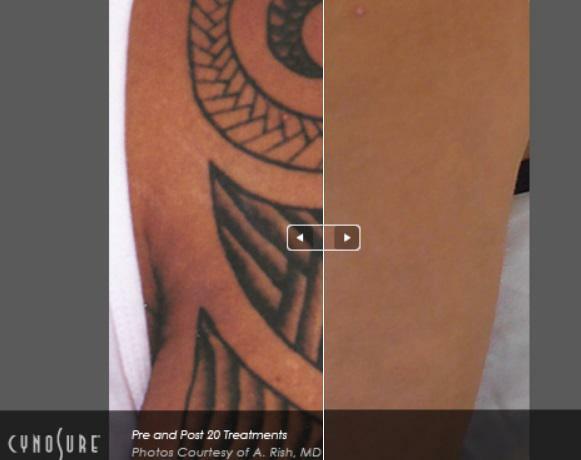 Our tattoo removal treatment works on all skin types, including very dark to light skin. Beams of laser light target and destroy pigment in the tattoo ink, so there is minimal risk of scarring. Laser tattoo removal can be performed on all skin types, including very light and very dark skin. Call today and schedule your consultation appointment to determine whether you are a good candidate for this treatment. Beams of laser light target and destroy pigment in tattoo ink without harming surrounding skin, so there's minimal risk of scarring and no extensive recovery. Laser tattoo removal treatment generally takes just minutes for small areas and about a half hour for larger areas. Most people experience some discomfort during the treatment. Ask us about pain management options. Usually, several treatments will be required for best outcomes. The number of treatment sessions required depends on how deeply the ink particles penetrated the skin and the chemical makeup of the inks that were used. Amateur tattoo ink can be removed more easily than professional tattoos, since ink is closer to the skin surface. Most people typically resume their regular activities immediately following the treatment session. Typical side effects include tenderness and scabbing at the treatment site after the procedure, which will resolve shortly after treatment. Call today and schedule your consultation appointment to discuss other potential side effects with you.